Jellyfish Stings are intensely painful stings caused by the tentacles of these transparent, gelatinous vertebrates. The most dangerous varieties of jellyfish are most commonly found in the Australian and Indo Pacific waters. Of the two thousand species of jellyfish, approximately hundred or even lesser number of jellyfish are considered dangerous for humans. As the free swimming jellyfish are non aggressive, most of the Jellyfish Stings are caused accidentally by wading into a jellyfish or handling the creature carelessly. 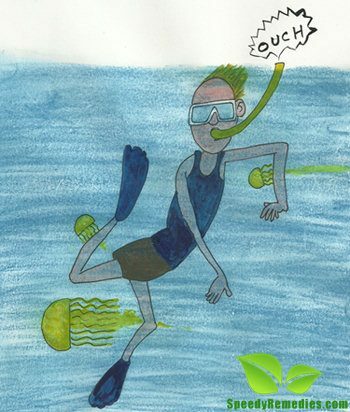 The effective treatment of Jellyfish Stings depends on the type of jellyfish that caused the sting and the type of water in which the injury took place. The natural treatment consists of a number of natural home remedies of Jellyfish Stings. Highly poisonous Jellyfish Stings, like that of a Box Jellyfish usually require administration of anti venom. As already mentioned, Jellyfish Stings are the result of coming in contact wit the tentacles of a jellyfish containing several venom filled cells called nematocysts. Sea Nettle, Moon Jellyfish, Irukandji Jellyfish, Portuguese Man of War and Box Jellyfish, particularly Sea Wasp are some of the most common varieties of jellyfish that that can cause severe symptoms of Jellyfish Stings and can even prove to be fatal. Box Jellyfish are generally more common off the shore of Northern Australia, Indonesia, Malaysia, Thailand, Philippines and Vietnam. As these stings are actually caused by the tentacles of Jellyfish, Jellyfish Stings can also be caused by loose tentacles floating in the ocean or tentacles of dead jellyfish. The stinging structures found in the jellyfish tentacles usually remain active for a long time, even up to two weeks after the death a jellyfish. Common symptoms of Jellyfish Stings are intense pain, itching, redness, rash, headache, nausea, vomiting, diarrhea, tearing, muscle pain, abdominal pain, lymph node swelling, numbness, increased heart rate, increased perspiration and nasal discharge. Severe cases may also be characterized by breathing difficulties, chest pain and heart failure. Allergic reactions can cause hives, wheezing, dizziness and other similar symptoms. Irukandji Jellyfish Stings tend to cause intense headache, lower back pain, restlessness, muscle cramps and extremely high blood pressure within five minutes. Though most of the Jellyfish Stings are not considered fatal, still the allergic reactions triggered by the venom can prove to be fatal for certain individuals. Before going ahead with the natural home remedies for Jellyfish Stings, it is important to note that Jellyfish Stings should be washed with sea water and not fresh water, especially in case of Jellyfish Stings that took place in salt water. Fresh water tends to increase the pain by releasing the toxins instead of deactivating them. Similarly, ice and hot water should also be avoided. In addition, try not to move the affected area as far as possible. For this, a light bandage can also be wrapped tightly above and below the wound for immobilization. Also, do not use sun lotion or any alcohol based liquid on the affected area. • Rinsing the affected area with vinegar (acetic acid) or soaking it in vinegar for about 15-20 minutes is one of the best Jellyfish Stings natural remedies for disinfecting the wound. Ammonia or lemon juice can also be used. • Next, remove the tentacles from the affected area with the help of a stick or tweezers. Gloves can also be used for this purpose. • Dusting off the tentacles of jellyfish with some baking powder is one of the most popular natural home remedies for Jellyfish Stings. Rubbing off the tentacle with the help of a piece of cloth is also useful in this regard. • Covering the affected area with beach sand for about five to ten minutes serves as one of the most effective natural cures for Jellyfish Stings. • Another home remedy for Jellyfish Stings is to scrape off the tentacles with a blunt knife after applying canned shaving cream on it. • Applying a paste of unseasoned meat tenderizer and water helps to ease Jellyfish Stings related intense pain. • Aloe vera gel and castor oil are also regarded as useful Jellyfish Stings home remedies. However, these remedies should be adopted after following the first aid measures. As a preventive measure for avoiding Jellyfish Stings, it is better to avoid swimming in oceans 8 to 10 after a full moon as jellyfish reproductive gatherings take place during this time thereby increasing the likelihood of getting Jellyfish Stings. Apart from adopting the above mentioned Jellyfish Stings home remedies, a general healthy diet consisting of judicious amounts of nutritious fruits, vegetables and whole grains rich in essential vitamins and minerals is highly beneficial in facilitating the process of healing Jellyfish Stings. Woah this weblog is wonderful i like reading your articles. Keep up the good paintings! You understand, lots of people are searching round for this information, you can help them greatly.